Previously a Royal Caribbean ship, Sovereign was transferred to Pullmantur in 2009. The ship has a multi-deck atrium and a top-deck lounge situated in the funnel that offers panoramic views of the sea. There are nine bars in which to sample your favourite tipple and five restaurants. Diners can choose from European or Asian cuisines, and even international dishes inspired by the ships ports of call. Gym addicts can burn some calories at the sports court and those in need of some R&R can unwind in the spa. Adults can try their luck at the casino and kids are well catered for too; drop them off at the kids club or the games arcade. Sovereign spends most of the year cruising around the Mediterranean. We’ve created a number of fascinating tours in the ports of call below. 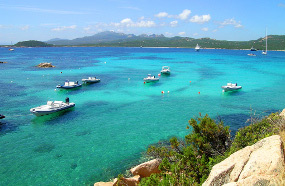 Join us for a trip back in time to the archeological site of Pompeii, or meet us in the paradise that is Porto Cervo.